Increases in wealth among countries are strongly linked to student achievement, as my Stanford University Hoover Institution colleague Eric Hanushek has shown. But in the most recent international achievement survey, American students ranked 27th in mathematics and 21st in science. Seventy percent of our eighth graders can't read proficiently, and most never catch up. About 1.2 million students drop out of high school each year and 44 percent of the dropouts who are under 24 years old are jobless. Yet the United States ranks among the highest countries in the world in per-student spending on public schools, and American spending has increased steadily and substantially in the last few decades with little to show for it. With poor performance and high spending, American public schools are grossly inefficient. They are also grossly inegalitarian in that poor families are typically confined to the worst schools in big cities, and their children drop out at higher rates than others in their age cohort before graduating. These children receive both fewer years of schooling and those they get are substandard. What accounts for poor American school standings? Though no longer an agrarian society requiring a long summer break for fieldwork, the United States has the shortest school year in the industrialized world, typically 180 six-hour days. In contrast, Asia’s high achieving, economically fast growing countries have up to 260 school days a year plus large amounts of homework and private tutoring after the regular school day. Examination success in these countries usually guarantees admissions to top universities, highly paid careers, and the best choice of marital partners. Compounding the problem, as my Hoover colleague Terry Moe has shown, are the teachers unions. They have maintained slack standard and their members generally work about 30 hours per week for only nine months, in contrast to the typical American workweek of 40 hours for a minimum of 11 months. Teachers union leaders have succeeded in representing the interests of their members. Most public school teachers have tenure and are rarely held accountable for performance by administrators or by state and local school boards. In fact, state and local district boards have failed mightily in their responsibility to represent the public, parents’, and students’ best interests in learning. Most public schools are local monopolies since parents must send their children to the school decided on by the school boards. The best student performance is concentrated in private schools, both independent and parochial, and, more recently, in charter schools, which are publicly funded but privately governed. Since private schools compete for students, they must serve them well or face declining enrollments and possible closure. My 2007 book School Choice: The Evidence and subsequent research show that private schools eclipse public schools in many relevant measures. On average, their students achieve more than those in nearby public schools, the private schools are more attractive to parents, and their tuition costs are typically about, on average, half of the annual $15,000 public schools spend per student. Newer forms of privatization have also been limited. Eleven states, for example, allow income tax deductions for private tuition, but the allowances typically do not cover the full costs of tuition. Besides, poor families, especially those in big cities most in need of good schools, gain little from such tuition deductions since they pay little income tax. Charter schools are also limited despite their achievement success and attractiveness to parents. Their numbers grew rapidly from none in 1991 to about 5,700 schools in 39 states recently, but many states and cities put limits on their numbers, forcing typical charter schools to turn away students. Only about three percent of all students in publicly funded schools attend charter schools. Parents who succeed in getting their children into charter schools are less likely to campaign for more charter schools and for reform of the entire public school system. Since charter schools require no tuition, there is less demand for private tuition schools, and many have closed in recent years. Poor parents are less likely to know about the complex process of getting spots for their children in charter schools, which contributes further to inequality in the the public school system. Many poor and middle class parents cannot afford to move to suburbs where, typically, the schools are better than in they are in the urban centers. Charter schools are increasingly threatened by unionization, which means their teachers may soon become less accountable. 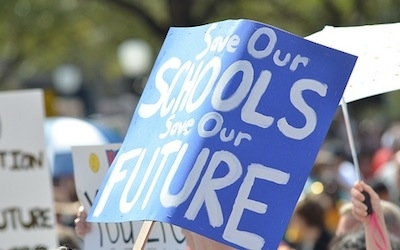 Public school boards may be less likely to provide financial and other support for charter schools in their geographical areas because charter schools make them look bad; charter schools often perform better and are more attractive to parents than schools for which the boards and their administrators have governing and operational responsibility. Charter schools are further limited or threatened by unproductive federal, state, and local regulations. Conflicting regulations and curriculum requirements curtail successful charter organizations from expanding the number of their campuses beyond a single city or state. The Parent Trigger, a promising new reform effort, further shows the obstacles standing in the way of substantial improvement in the K-12 system. Initially introduced in California, it is now being considered in 20 states. Seven other states have actually passed it into law. The Parent Trigger applies to schools that states designate as failing and for which the majority of parents sign a petition (though there are variations) to replace the school staff, issue a charter to a private organization to operate the school, or close the school and allow the students to attend other public or private schools. Among the problems with Parent Trigger is that states rely on their own slack achievement standards in determining which schools are failing, notwithstanding extensive cheating on examinations by students and educators. The Obama administration, moreover, has issued waivers to 33 states enabling them to further slacken their standards, leading to fewer schools being designated as failing, which further denies parents their ability to exercise choice under Parent Trigger legislation. Compared with privately provided goods and services, perhaps the most fundamental market problem with publicly funded schools is to provide a uniform education that is satisfying to all families. How difficult would it be for automobile manufacturers, restaurants, hairdressers, and barbers to satisfy the majority, let alone all, of their clients with a single, uniform product or service? And costs don’t seem to be the problem. Despite its well-known failings, a public school K-12 education currently costs, on average, about $195,000 per student. Neither families nor states can continue to afford such a large and failed investment in students’ futures and the nation’s future. Given the continuing failure and high and rising costs of public K-12 education, how might more poor and middle class families be given the school choice they greatly desire? How might private schools be expanded to compete with public schools? As my Heartland Institute colleague Joseph Bast has pointed out, the Savings Grant Program before the Texas legislature might provide the best model. It is scheduled for consideration during the next legislative session, and it overcomes most of the past failings of privatizing schools to offer school choice to substantially more families. The Texas governor and lieutenant governor have urged radical school reforms, and legislative leaders have endorsed the Savings Grant Program for several reasons. The legislation would reimburse parents for the tuition costs of the private schools they choose or 60 percent of the Texas average per-pupil public school expenditure, whichever amount is smaller. Thus, each participating student would save the state at least 40 percent of the usual public school per-student cost. Presented as a budget proposal rather than yet another “education reform,” it consists of only five sentences. The plan is so simple that the state Comptroller’s office, rather than the Texas Education Agency, would administer it. It would avoid the usual lengthy and complex school legislation requiring interpretations, additional administrators at the state, school district, and school levels, and possible lawsuits. The Texas plan differs from charter, voucher, and tax deduction plans in key ways that will give parents substantially more choice. Unlike voucher and charter school plans, enrollment isn’t capped, there are no family poverty requirements, and no new regulations on participating schools. Oversubscribed schools could enlarge or multiply the number of their campuses. Unlike tax credit plans, participation is not limited to people who pay state income taxes; every child receives the same sized grant, and no bureaucratic agencies nor regulations stand between parents and the schools they choose. For these reasons, it appears that the Texas plan may be the last, best hope for American K-12 education. The failures and high costs of American public schools have remained a threat since publication of A Nation at Risk: The Imperative For Educational Reform, the 1983 report of President Ronald Reagan’s National Commission on Excellence in Education. The subsequent reforms and rising expenditures have accomplished little in three decades. The future of our children and this nation requires a bold new vision for school reform. The Savings Grant Program embodies that vision.